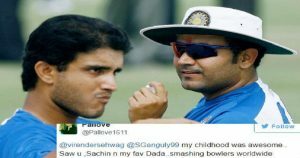 It is undoubtedly clear that former ace cricketer Virender Sehwag took on to his second innings on Twitter. Since the beginning, Sehwag has been spreading some unbeatable humour across the social media. His wit and humour is something that everyone loves. Now, this message made people laugh but also nostalgic at the same time; many reminisced about the time when Ganguly was team India’s captain. Netizens ended up going back to 1990s when the vintage players ruled the game under Ganguly’s captaincy.